I am writing this in Maryland, USA where it is July 31. Currently in Japan, it is August 1. Today, July 31, 2013 is my father's 80th birthday. 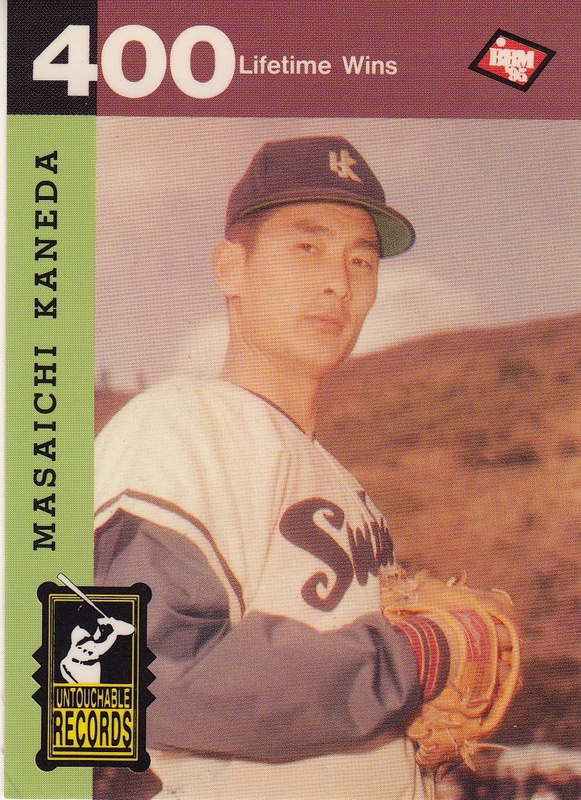 Today, August 1, 2013, is also the 80th birthday of the great Japanese (well, actually ethnically Korean) pitcher Masaichi Kaneda. I'm not sure what time of day either of them was born but it amuses me to think that they could have been born at the exact same moment but in different days due to the differences in time zones. Following his playing career, Kaneda managed the Lotte Orions on two separate occasions - from 1973 to 1978 and again from 1990 to 1991. 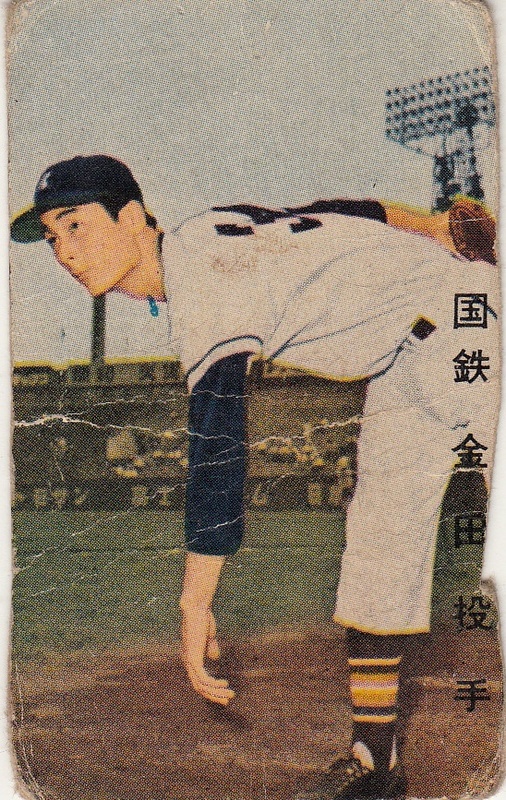 He won the Japan Series in 1974 over the Chunichi Dragons. Kaneda owns the career records for strikeouts (4490), wins (400) and complete games (365). 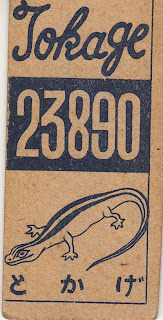 Also losses (298) and walks (1808). 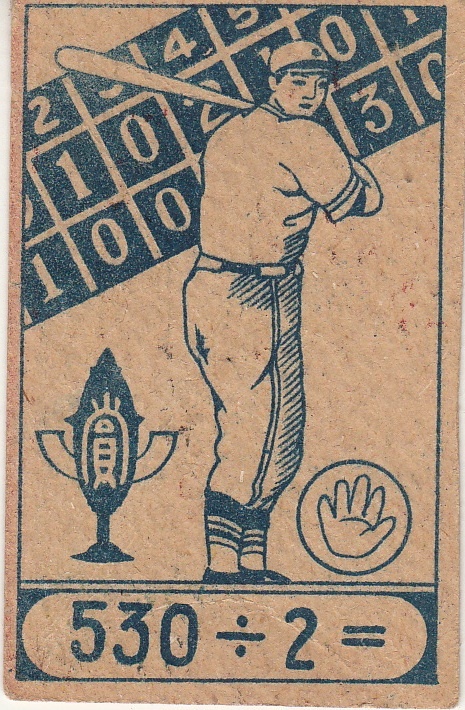 As you might expect from someone who pitched so long, he also has pitched the most innings (16,580 5526.2). 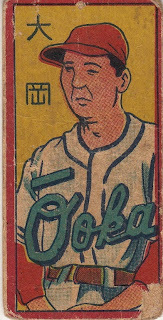 He finished his career one shutout behind Victor Starffin for the lead (83 for Starffin, 82 for Kaneda). 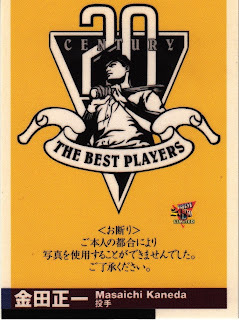 Kaneda has the oddest collection of cards for any Japanese Hall Of Famer. There really just aren't that many of them. 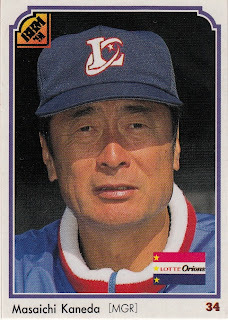 It doesn't look like he has EVER had a Calbee card - the years in the 1970's when he was managing Lotte and Calbee was making huge sets that had all the managers were also the years when Calbee wasn't printing any cards of Lotte team members. 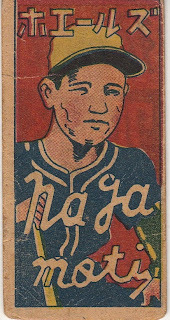 As a result, there's just a couple NST cards and a Broder card that show him as Orions manager. 1991, BBM's first year, was his last year as manager so there's just the one BBM card of him as manager. 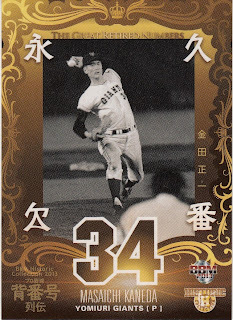 He never showed up in any of the "Nostalgic Stars" subsets that BBM did in the 1990's - just the two "Untouchable Records" cards from 1995 and a "50's Best Players" subset card from the 1999 set. 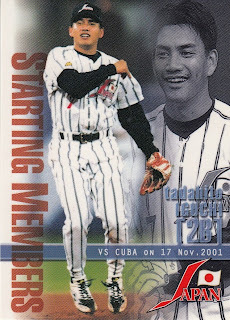 His only other appearance in a BBM flagship set was his card in the 2001 "Retired Uniform Number" subset. 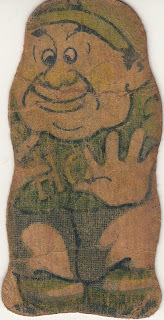 He also appeared in an OB subset in a box set BBM did for the Marines in 1997. He did appear in the 2009 Legend Players set (for the 60th Anniversary of the two league system) and the 2012 No-hitters set. 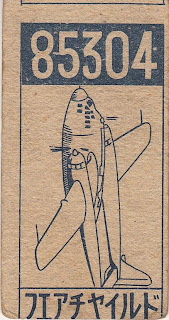 And I should not fail to mention that BBM did a 34 card box set for him a few years ago. 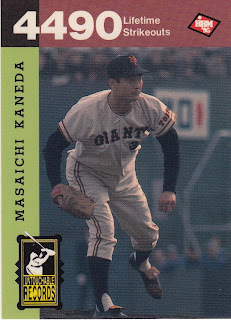 Thanks much to the Japanese Baseball Database for Kaneda's career stats and to Jason Presley for the great work he has done adding cards to the database at Sports Card Forum for the information on what cards Kaneda's had since the late 1960's. 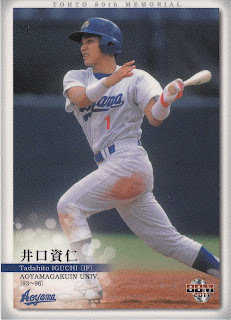 Going to have to do this a little quick but I didn't want to let too much time go by - last Friday, Tadahito Iguchi became the latest player to reach 2000 career hits (fourth this year and seventh in the past two years). 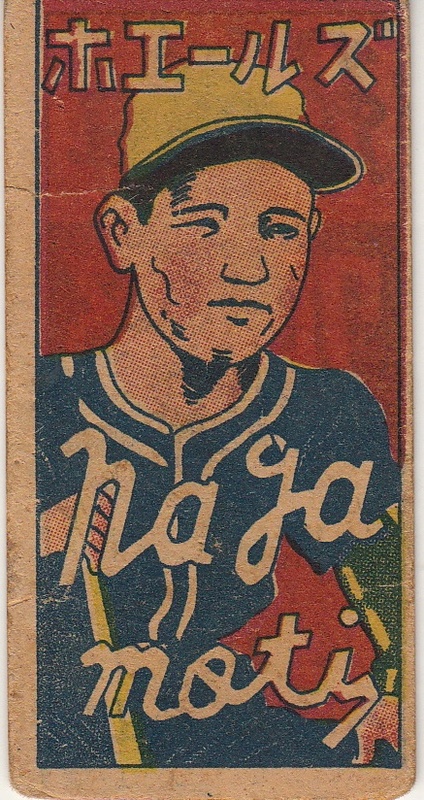 It was his 1506th hit in NBP to go with the 494 hits he had in his four years playing in MLB. Iguchi was a first round pick by the Fukuoka Daiei Hawks in the 1997 draft (which was in the fall of 1996) out of Aoyamagakuin University of the Tohto University League. He spent his eight years with the Hawks before departing for the US in 2005. 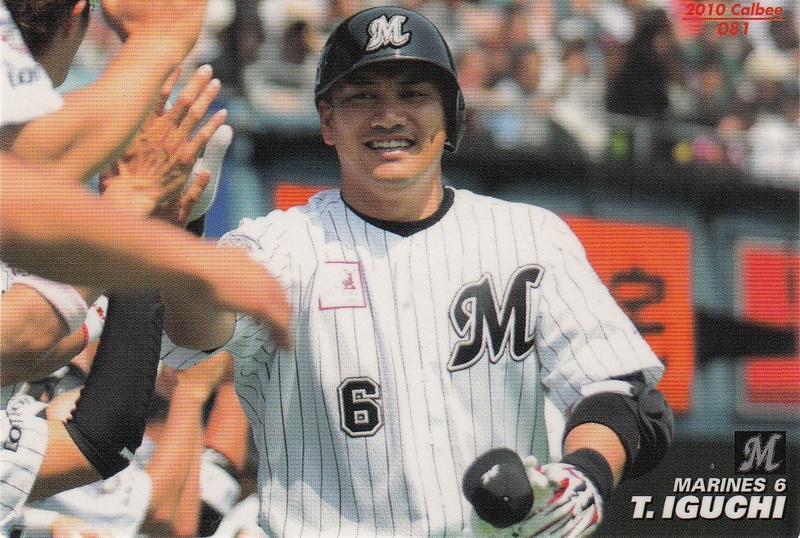 After four years in the US, he returned to Japan in 2009 and signed with the Marines. 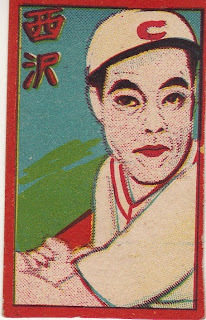 It used to be fairly common for an MLB team to tour Japan following the season. 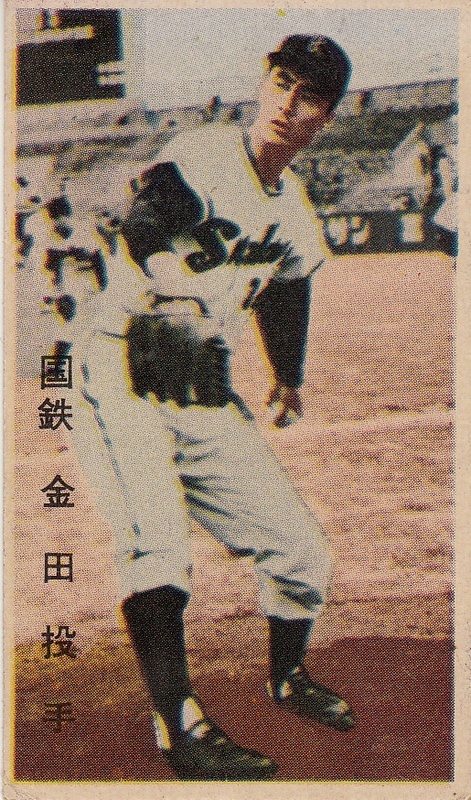 In the 31 years from 1953 to 1984 there were 13 times when an MLB team came to Japan (and once when the Giants came in the 1970 preseason). 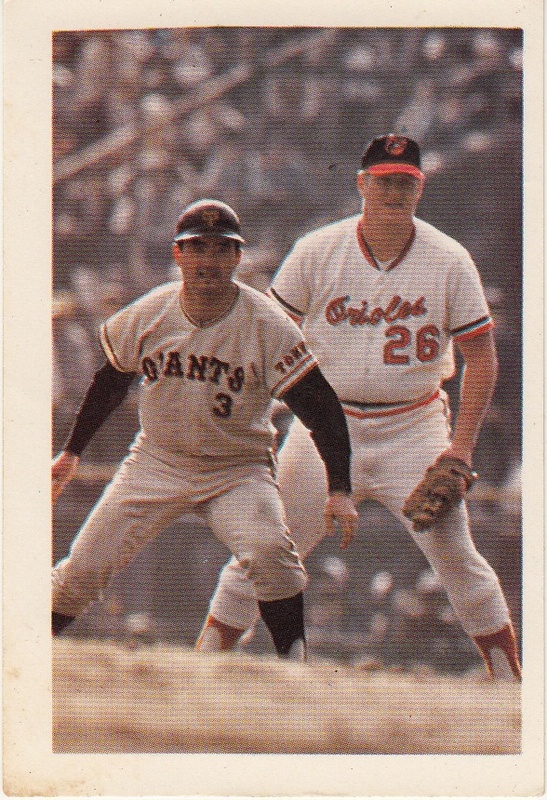 Following the Orioles tour in 1984 it appears that the team tours have been discontinued and replaced with the bi-annual MLB All Star tours which started in 1986 and I think stopped after 2004. The only other games between MLB and NBP teams appears to now be some exhibition games against the Tigers or Giants when MLB has opened the season in Japan (in 2000, 2004, 2008 and 2012). There aren't that many cards that I'm aware of that feature any action from any of these tours. 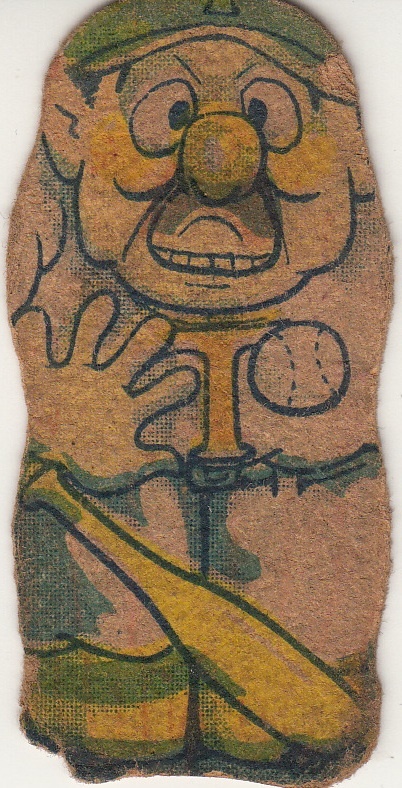 There's a Broder set for the Mets tour in 1974 and a handful of NST cards from 1975 showing scenes from a couple earlier tours. There are some card sets that coincide with a tour but since they are meant to be sold during the tour, they don't show action from the tour itself. 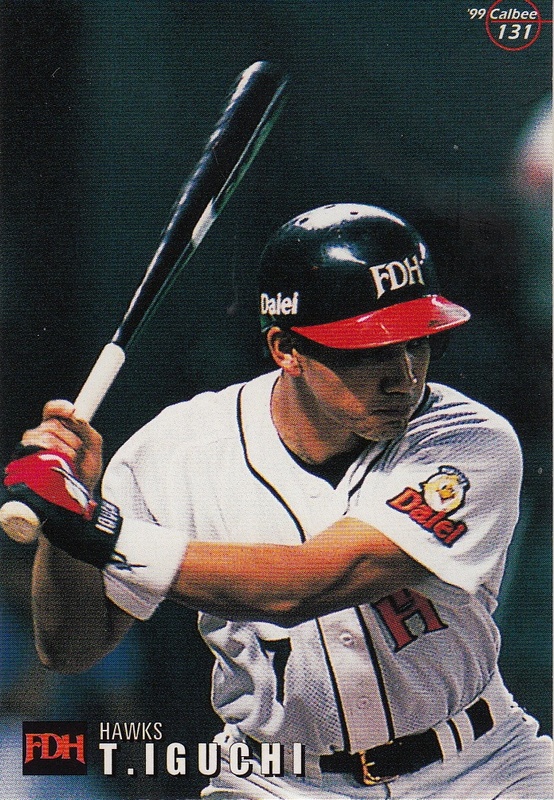 If you watched the Home Run Derby before Friday's All Star game in Hokkaido Dome, you were probably a bit underwhelmed by the results. 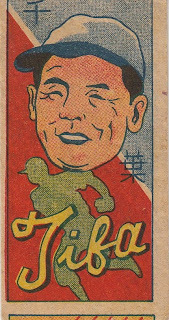 The total number of home runs hit by the contestants was five, three by the Derby winner Tony Blanco. What I found interesting about the Derby was that Blanco's pitcher was Akihito Fujii, a catcher with the Tigers who was also on the All Star roster. 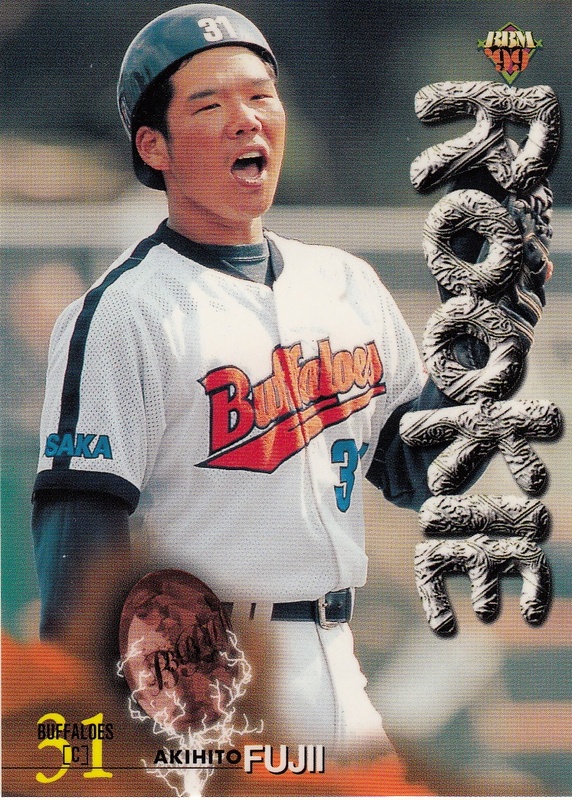 I have no idea why Blanco had Fujii pitch to him or what the connection between the two of them is, but obviously it worked. To make a comparison, imagine if Buster Posey had been pitching to Yoenis Cespedes last Monday in New York. Yeah, it's really that weird. If you want to see a home run that was much more impressive than what was hit Friday in the Derby, check out what Craig Brazell did last Wednesday. I thought I'd do another post about some vintage cards I picked up on Ebay a few months ago. I've figured out a lot more about these cards than the ones I talked about before. 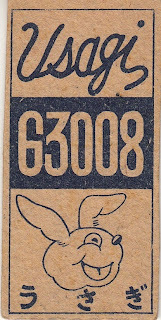 Among the many menko sets that Gary Engel's latest Price Guide and Checklist (the vintage edition) lists for 1950 there are two somewhat related ones called "Animal Back" (JCM 117) and "Transportation Back" (JCM 118). 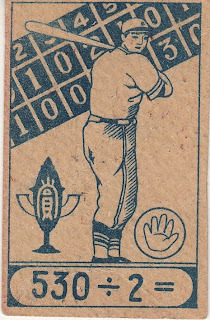 I say they are somewhat related because both sets feature the same style fronts and in fact there are known to be cards with identical fronts in both sets. 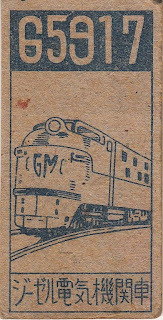 The card backs feature animals (for JCM 117 obviously) and cars, trains and airplanes (for JCM 118). 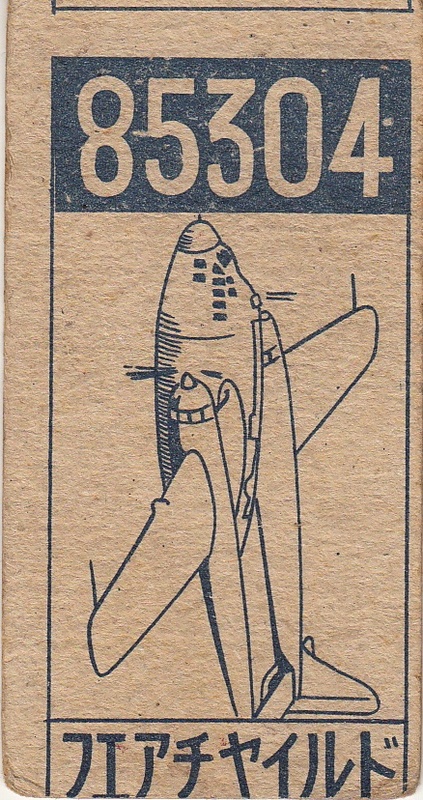 Multiple cards use the same backs for both sets, so the backs are completely useless in uniquely identifying a card. The fronts of these cards are very colorful. Some of them have the team name in English, some of them have the player name in English and some of them have no English at all. The player name is always on the card, but it could be in kanji or katakana (as well as English). The team name is not always on the card. 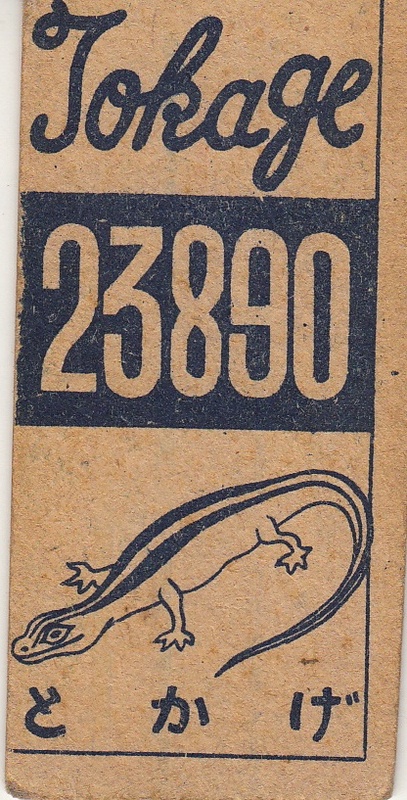 I won an auction containing 10 vintage menko cards that appear to be either from these two sets or from some other, uncatalogued related sets. It's not clear that any of these cards are actually listed in Engel at all. I think I've managed to figure out who several of the players are. 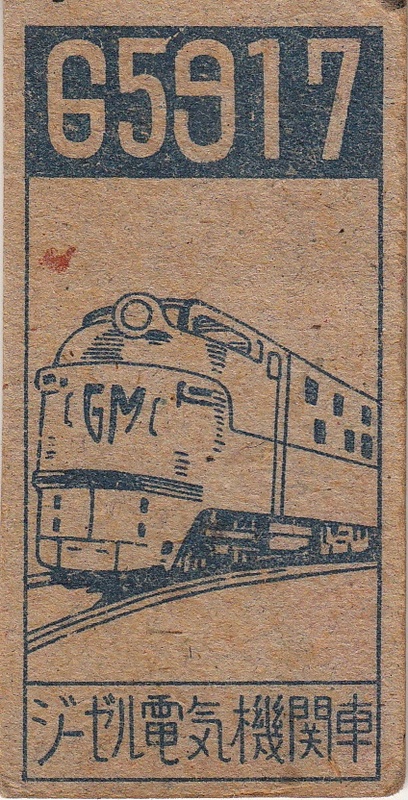 The first card is from the "Transportation Back" set. 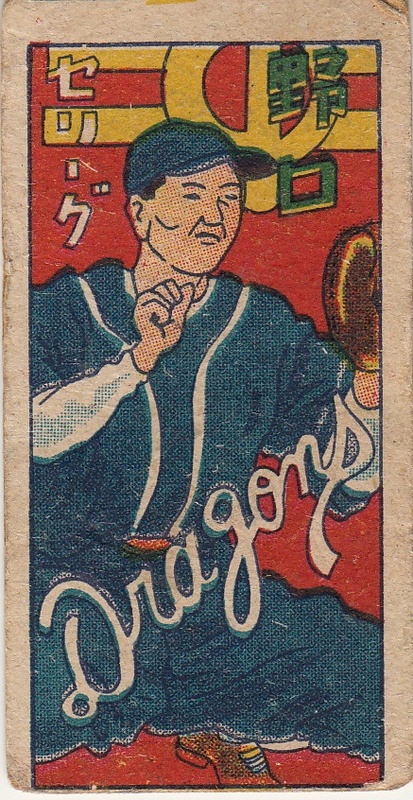 This is Akira Noguchi of the Dragons, the oldest of the four Noguchi brothers who played in the 1930's through the 1950's (and includes Hall Of Famer Jiro). 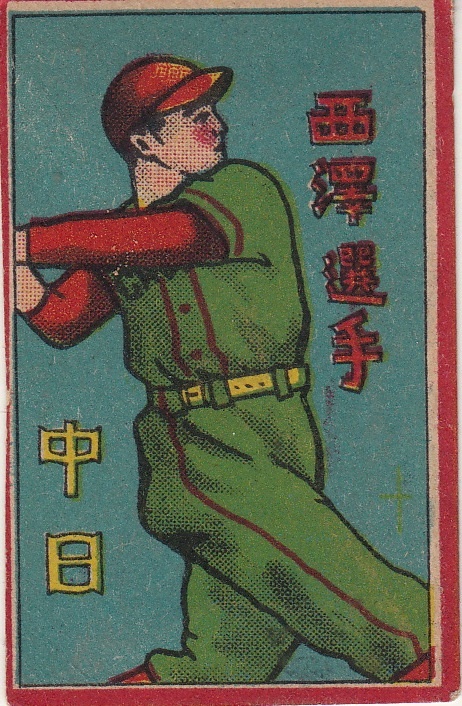 I identified the player using the team name and the kanji in the upper right corner. 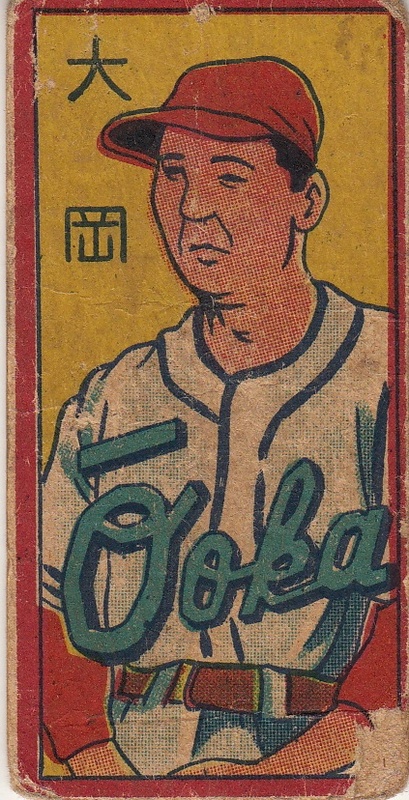 I think that the katakana in the upper left says that Noguchi plays in the Central League - 1950 was the first year of the two league system. 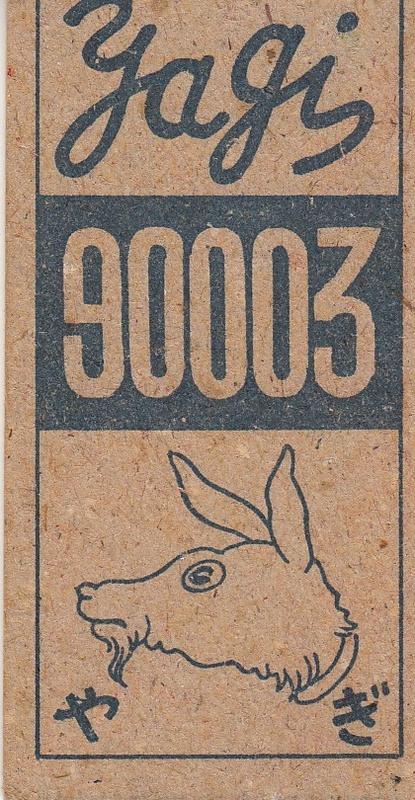 The next six cards are from the "Animal Back" set. 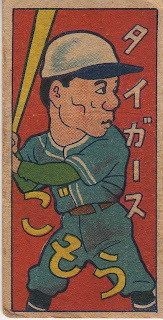 The first is Makoto Kozuro of the Shochiku Robins. As before, I got the player's name from the kanji and the card is not listed in either set. The katakana is for the Pacific League I think. I've narrowed this next card down to two possibilities. 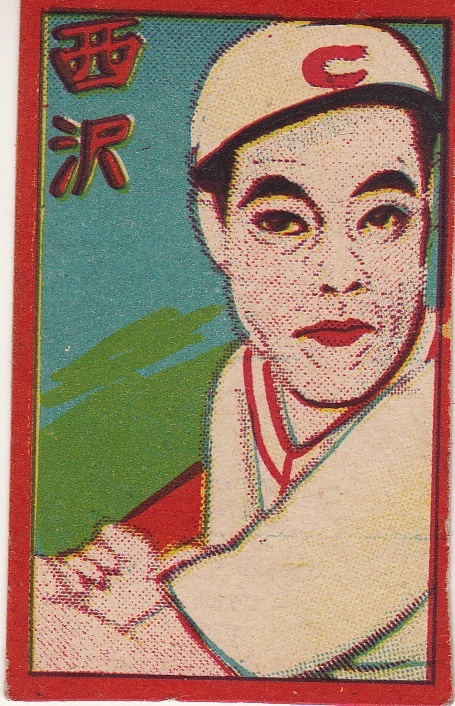 The kanji is for "Kato" but the 1950 Kintetsu Pearls featured two players with that surname - Masakazu and Haruo. I don't know which of them this is. 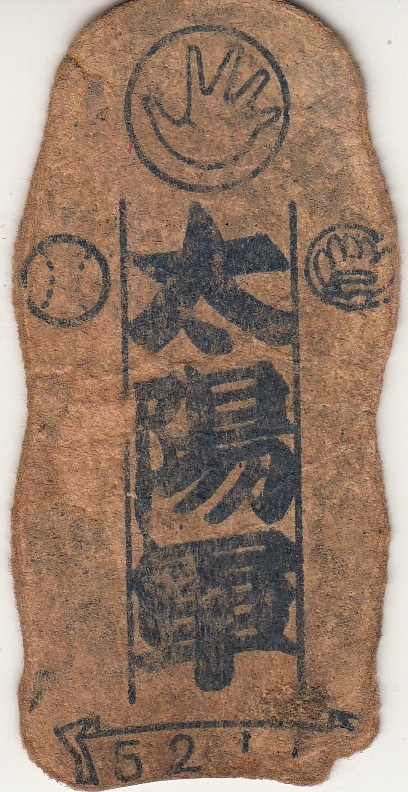 I wonder if the kanji in the yellow dot would tell me if I knew what it was. 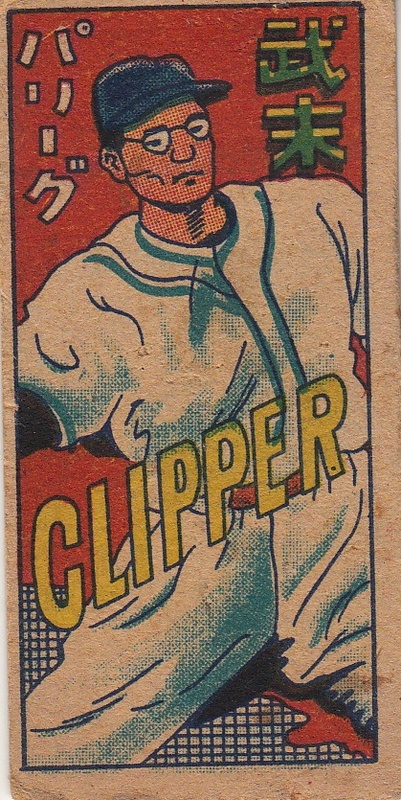 This next card is one that helps to date the set to 1950 - the only year the Nishitetsu Clippers existed. This is Shissho Takesue. 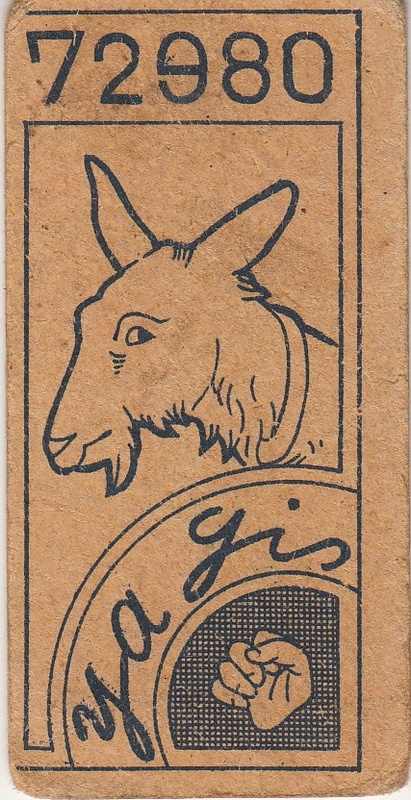 Engel lists two Takesue cards in the "Animal Back" set but this doesn't appear to be either of them. 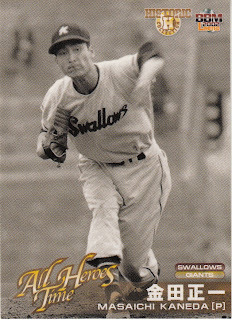 This next card was a bit of a surprise to me when I figured out who it was - it's Hall of Fame manager Yukio Nishimoto from his playing days. 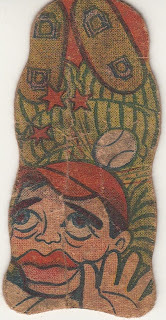 Engel does not list this one either. I don't know for sure but I have a pretty good idea who this next card is. 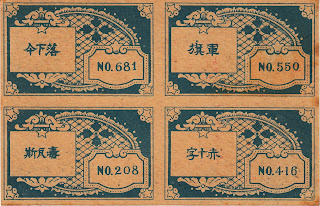 I think the katakana at the top of the cards says "Whales" but there was no one on the 1950 Taiyo Whales with the surname "Nagamoti". 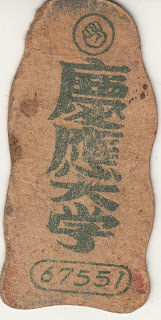 What I wonder is if that's a transliteration error for Eikichi Nagamochi. 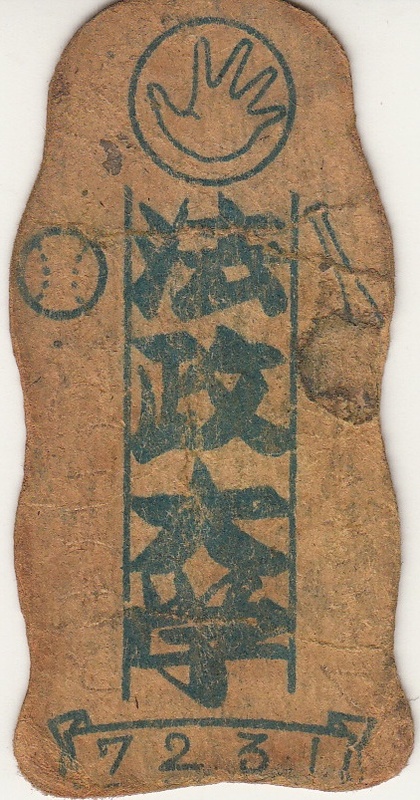 The other possibility is that the last two consonants got switched and it's really (Masatake) Nagatomi. I'm confused on this last card. 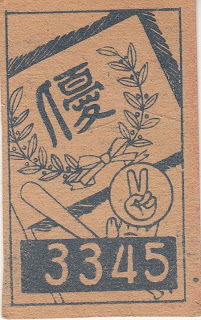 I think the two kanji characters are for Chiba, as in Shigeru Chiba. But I don't understand what "Tifa" would be. 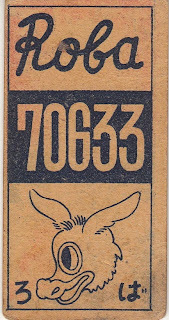 The last two cards are from sets that appear to be related to the JCM 117 and 118 sets but have a different style back. 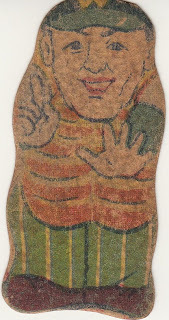 The first is this card of Torao Ooka of the Robins. 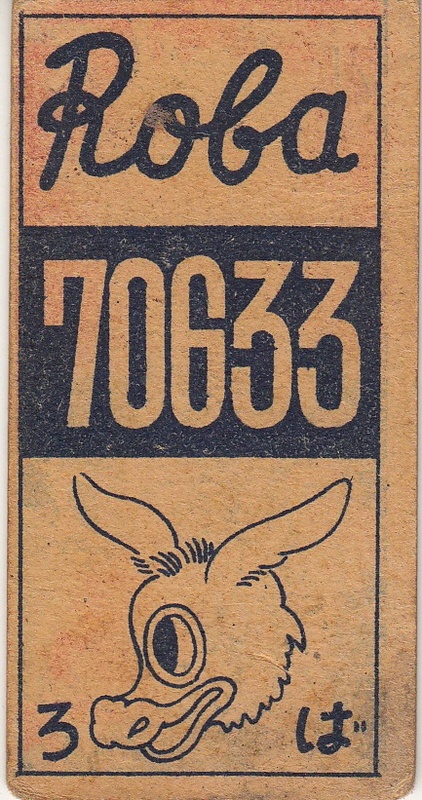 As you can see, it has an animal on the back but the style is different from the JCM 117 set. 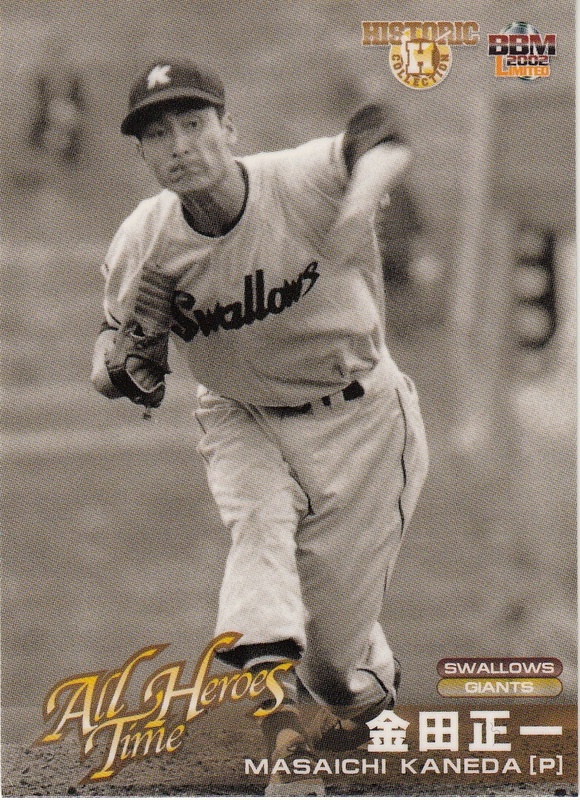 The other is this card of Kazuo Kasahara of the Hawks. The back is completely different from all the other cards. I noticed that the last two cards have the player's name in both English and kanji. 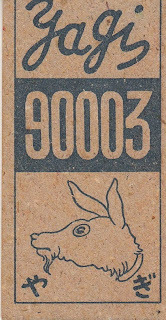 This may actually differentiate these cards from the "Animal Back" and "Transportation Back" cards as I don't know if any of them had the name listed twice in different alphabets. 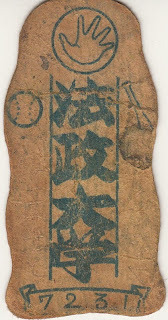 I'd be curious to know if I read the kanji and katakana right and if anyone has any light to shed on these cards in general. 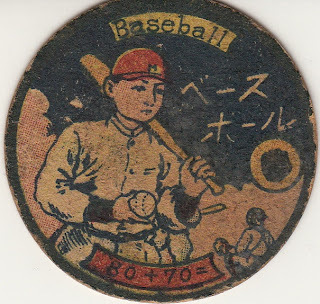 I've picked up some odds and ends in vintage Japanese baseball cards off of Ebay in the last few months and I have no idea what some of the items are. 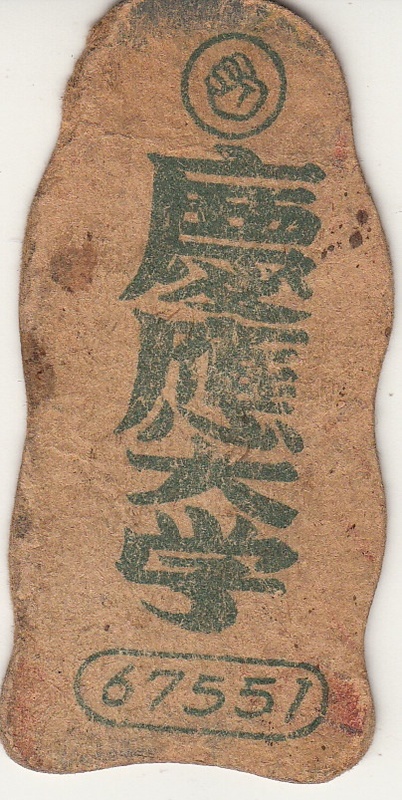 I thought I'd show them here and see if any of you have any idea (or can at least read the kanji on them). 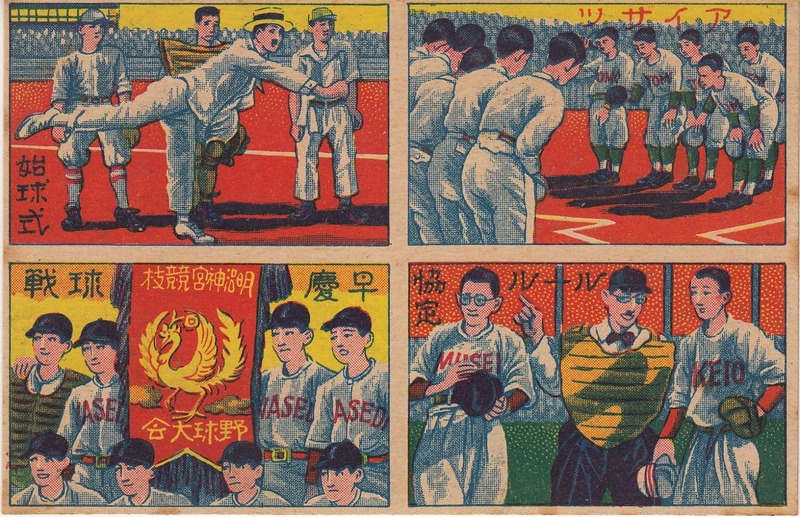 First up is an uncut menko sheet showing four cards that appear to depict university teams - I recognize Waseda and Keio right off the bat. 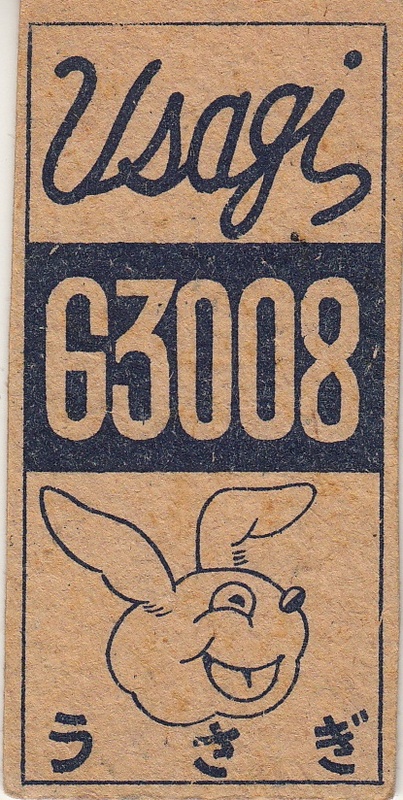 This sheet is very similar to one shown on page 47 of "Sayanora Home Run!" - I've seen a larger sheet selling on Ebay that contained both the sheet I have and the one from the book so I'm pretty confident that they're from the same set. 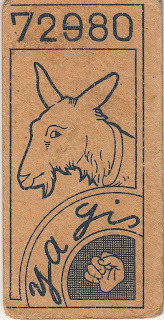 The book lists the cards as being from the 1920's - if so, then these are the oldest cards I have. 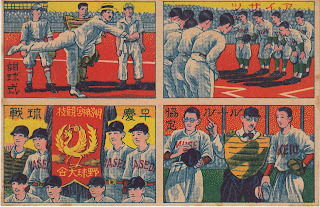 I picked up five die-cut menko cards that also appear to me to depict university teams. 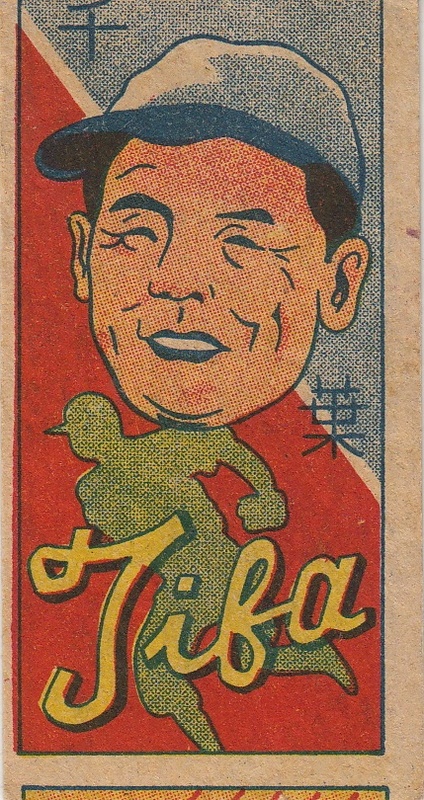 I'm not sure they actually depict a specific player - they kind of look to me like a caricature of a generic ball player. 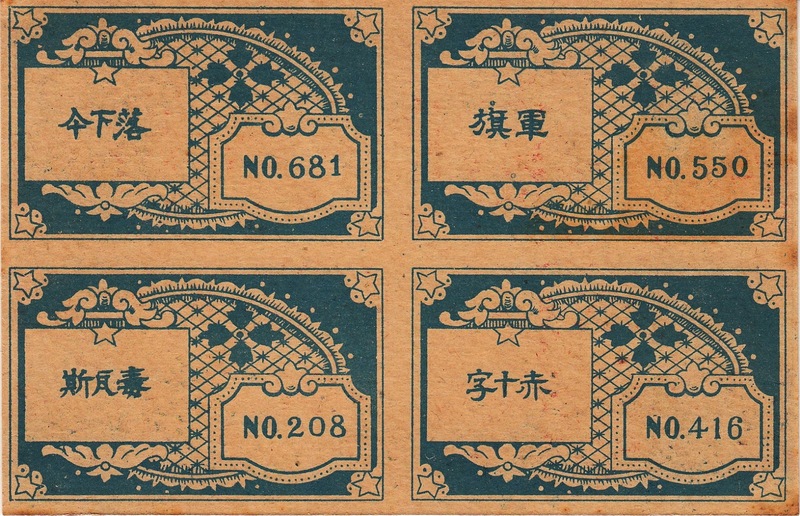 The five cards appear to be from three separate sets. The front of the uniform on the second card could be saying "Hosei" and the back of the cards appears to be showing the kanji for Hosei University. I thought the "T" on the front of the uniform for the first card could stand for "Tokyo University" but I don't think the kanji on the back matches. 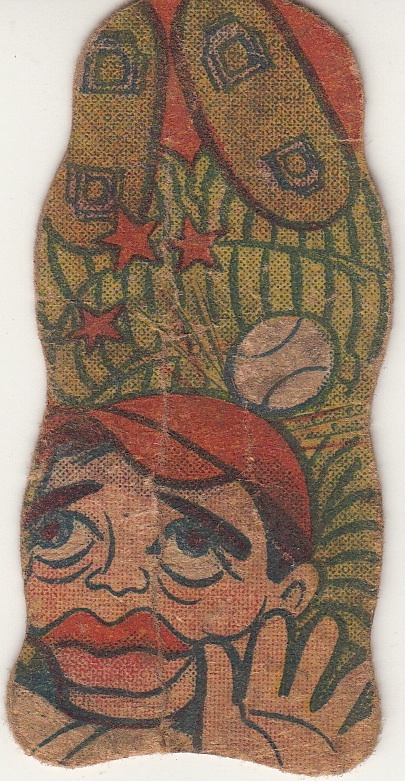 It might not be obvious because I think my scanner cut off a little at the top, but the hat on the first card has a "W" on it and the hat on the second card looks like it might have a "K" on it. 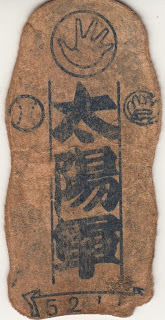 "W" immediately makes me think of Waseda but the kanji on the back doesn't appear to match. On the plus side, the kanji on the second card does resemble the kanji on the Keio cards from the BBM Tokyo Big Six sets so maybe the "K" is Keio. 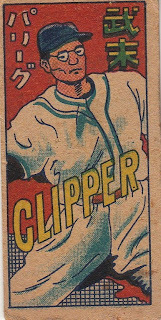 No lettering on the hat or the uniform so I have no ideas on this one. The last card is a blank backed round menko card. 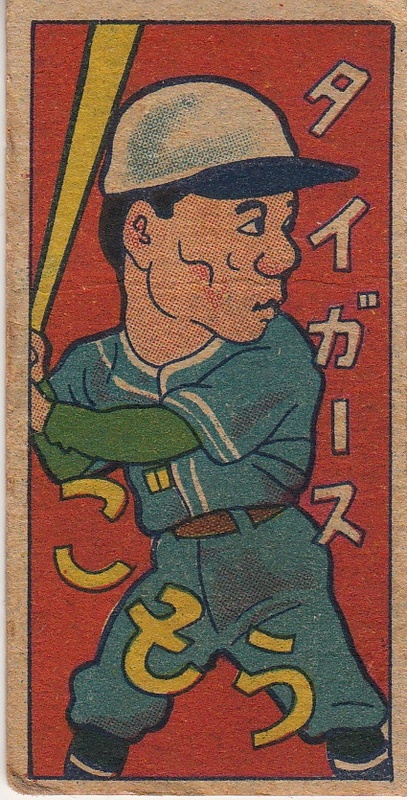 Like the die-cut menkos, it could be that this card shows a generic ball player rather than someone specific. 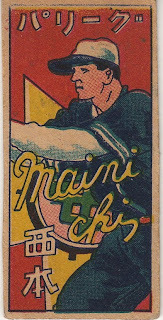 There isn't much identifiable on the hat or uniform - except maybe that's an "M" on the front of the hat. I'd appreciate any help anyone can give me on these.